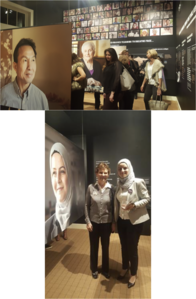 Fairfield, CT - The poignant and fascinating stories of immigrants and refugees who have found a home here were unveiled Thursday, February 8 at the opening reception of the Fairfield Museum’s new and timely exhibition, An American Story: Finding Home in Fairfield County. The exhibition also honors the 100thanniversary of the Connecticut Institute for Refugees and Immigrants (CIRI), which was founded in 1918. More than 150 people attended the opening, including the immigrants and refugees who shared their stories in the exhibition. Attendees were the first to view the powerful biographical narratives, authored by Lynne Penczer, and the large-scale portraits, taken by Caren Winnall, in the Museum’s Spaght Gallery. The reception featured international hors d’oeuvres from Festivities Catering, a special poem from Elizabeth Deutsch, whose story of survival during the Holocaust is part of the exhibition, and remarks from Claudia Connor of CIRI, Michael Jehle of the Fairfield Museum, and Jack Leslie, former Chairman of the United Nation’s High Commission for Refugees. An American Story highlights the experiences of eight individuals, from Cambodia, Congo, Cuba, Hungary, India, Rwanda, and Syria, who have built new lives in Fairfield County. Seeking safety and opportunity here, refugees and immigrants from around the world have added to the fabric of our communities. The exhibition will spark important conversations about this timely topic, and the Fairfield Museum hopes to facilitate those discussions through a variety of programs, Museum After Dark lectures and a film series planned for the run of the show. “The Fairfield Museum is a community center where people come together to explore the historic context of current events and discuss ways we can work together for collective solutions to some of the challenges we face. The Fairfield Museum serves as an important forum where people can engage in meaningful discussions and learn from each other,” said Fairfield Museum’s Executive Director Mike Jehle. On Thursday, Feb. 22, from 6 to 8pm the Museum will present “Stories of Hope: From Rwanda to America,” with siblings Daniel Trust (Ndamwizeye) and Evelyne Mukasonga, who survived the Rwandan genocide and came to Connecticut as refugees. On Thursday, March 15, from 6 to 8pm, the Museum After Darkpresentation will be “Women Rebuilding.” Marco Werman, senior producer of Public Radio International’s “The World” will moderate a discussion about women’s empowerment projects in Connecticut that are giving immigrant women opportunities. And on Thursday, April 19, from 6 to 8pm the Museum will present “Sanctuary: Interfaith Forum on Refugees,” which will highlight the different ways that faith-based communities are offering diverse approaches to meet the needs of refugees and immigrants. The Film Series will begin on Sunday, March 4, at 4pm with “Refugee,” which follows the experiences of Syrian refugees Fatima and Oday Al-Hamidi and their children who arrived at a bus station in Bridgeport, Connecticut on September 22, 2016. Filmmaker Josh Shelov will speak about his film. On Wednesday, March 28 at 12:30pm, “Searching for Wordin Avenue” will be shown. The film commemorates the Hungarian community in Bridgeport and the immigrant experience. On Sunday, April 15, at 4pm “Rebuilding Hope” will be shown, and filmmaker Jen Marlowe will speak about the film, which traces the journey of Southern Sudanese “Lost Boys,” who fled Sudan as children in 1987. Several other short films including “Shirin’s Dream” and “Magic Shoes” will be shown on a free Community Day, Saturday, June 9, 10am – 2pm. An American Story runs through July 23 and is open daily from 10am to 4pm. The Fairfield Museum is located at 370 Beach Road. Additional program information can be found at Fairfieldhistory.org or by calling (203) 259-1598. The Fairfield Museum & History Center and Museum Shop, located at 370 Beach Road, is open seven days a week, 10am-4pm. Members of the Museum and children under 5 are admitted free. For more information, call 203-259-1598 or visit Fairfieldhistory.org. The Fairfield Museum relies on funding from individuals, corporations and foundations. The Museum is especially grateful for leadership support from the State of Connecticut, Town of Fairfield and Fairfield County’s Community Foundation.